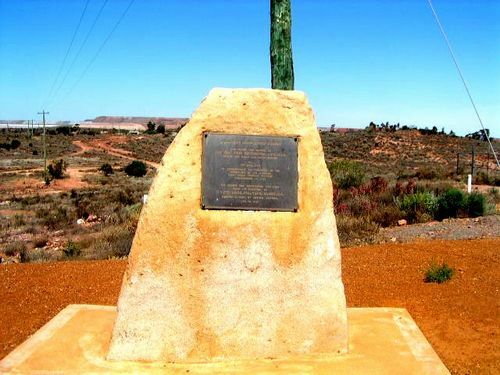 Monument commemorates the 60th Anniversary of the goldfields water supply. In 1903 the first water was pumped from Perth to Kalgoorlie, 600 kilometres east, along the newly built Coolgardie Water Supply pipeline. The pipeline was the vision of Charles Yelverton O`Connor, Chief Engineer of Western Australia from 1891 to 1902, who managed what many people considered was the impossible, to pump 22,700 cubic metres of water from the plentiful supplies of Mundaring Weir (East of Perth), lifting it 355 metres with only eight pumping stations, and delivering it to the dry goldfield towns 600 kilometres away. This major engineering feat was treated with much scepticism by the press and politicians of the day whose unprecedented criticism of the project drove O`Connor to suicide a year before the pipeline became operational.